Limerick Suicide Watch reach major milestone with charitable status. THE Chairman of Limerick Suicide Watch says the securing of charitable status by the organisation should enable it to raise more funding. 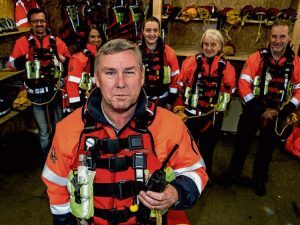 The organisation, which has more than 50 volunteers, carries out foot and bike patrols four nights-a-week on the city’s three main bridges and along the riverside. Volunteers, who are fully trained, carry out an average of two ‘interventions’ every week. Ger McNamara, Chairman of Limerick Suicide Watch, says securing charitable status is a major milestone for the organisation. “It is a big deal because companies that wanted to donate to us in the past were not able to because we didn’t have charitable status which they can use in their accounting system,” he explained. “On top of that it really raises the profile of the organisation because everything is accounted for and it is all above board and it give us far more Kudos,” he said. Ger says the securing of charitable status will make it easier to secure financial support from bigger companies. “For the bigger organisations – the multinationals – that wanted to donate to use before the couldn’t do but now they can,” he said adding that up to now the primary source of funding has been from donations from members of the public. Volunteers from Limerick Suicide Watch, which is based at the Tait Business Centre on Dominic Street, carry out patrols on Monday (8pm-midnight), Tuesday (9pm – 1am), Thursday (9pm – 1am) and Saturday nights (midnight-4am). At present there are almost 50 volunteers while 20 more are currently being trained. The securing of charitable status by Limerick Suicide Watch is the latest boost for the organisation. Last month Meath-based company EMR Integrated Solutions donated high-tech two-way radio handsets, a charger, base station and antenna to the organisation. © 2016 Limerick Suicide Watch. All rights reserved. Web Design & Hosting proudly sponsored by Designworx & Vmotion Hosting respectively.